Only those users who have access to the FiLIP watch via the mobile application are able to send text messages to the device, and they may only do so through the mobile app. Because of the way data is sent to the device, it cannot receive text messages sent the way you might send one to a typical mobile phone. This measure is intentional and is designed to give the parent greater ability to decide who may and may not communicate with the child. If you would like to give the other contacts the ability to send text messages to your child (as well as view your child’s location on a map and receive SafeZone notifications), you can grant that contact Guest Status. 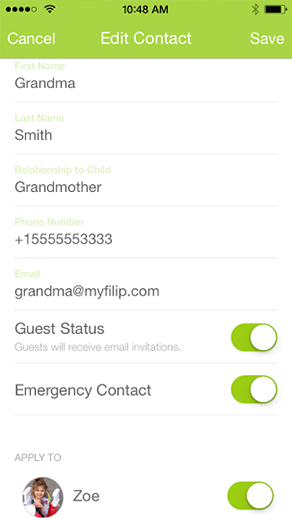 Click here to read more about setting up Guest Status for your contacts.